After all, there are many alternatives available to you. You can work with companies who provide ‘done for you’ options with quick turn around. There are even companies who offer websites built by artificial intelligence that can create a new website for you in one day. A custom website used to be your only option. But now you can choose a website option that’s best for you based on a number of different factors. Spoiler alert – our company provides custom web design services. Rather than just tell you the positives of our services and the negatives of others, we’ll give you the full picture when it comes to the custom vs template website debate. 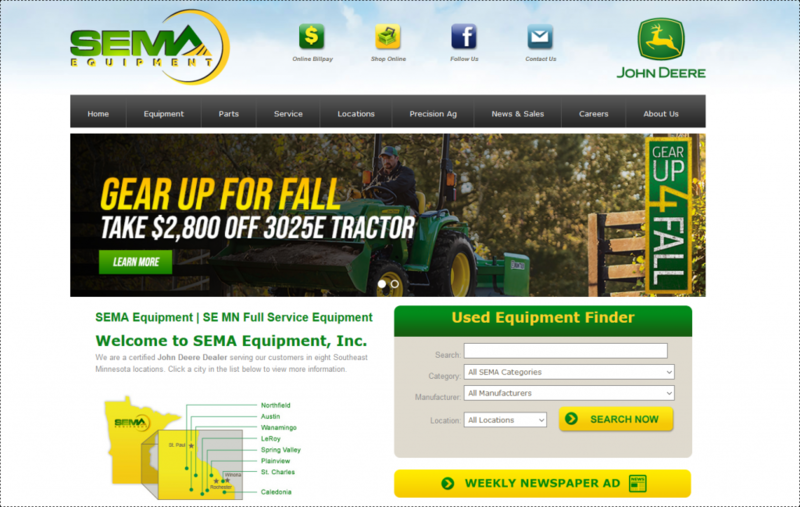 SEMA Equipment is a John Deere manufacturer with multiple locations and a customer base of thousands in the SouthEast Minnesota area. This is a robust website with thousands of pages, which means SEMA relies on our expertise to make site updates and improvements for things like UX, SEO, and order processing. 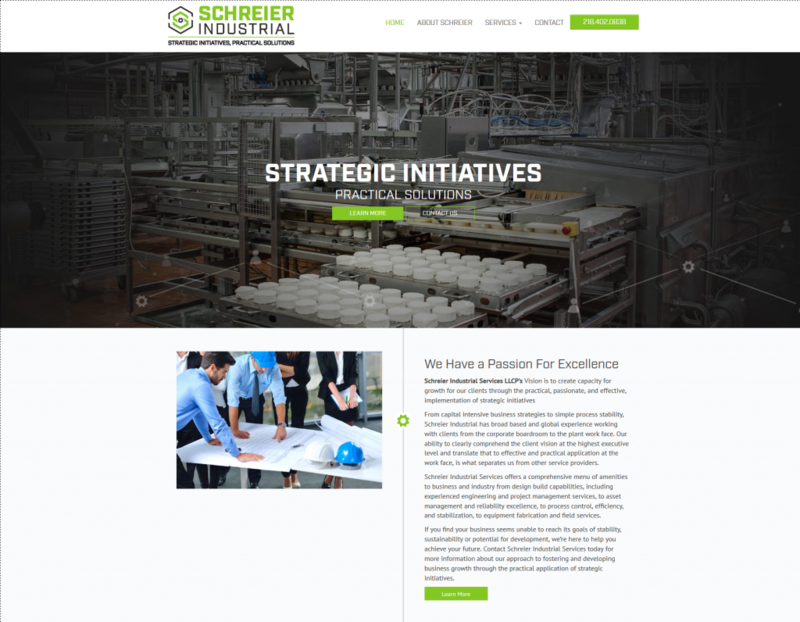 Schreier Industrial services helps manufacturing businesses improve their processes. Our custom website design and color scheme help represent the company’s core values including precision, expertise, and rapid improvement. If you click through to the website, you’ll see custom animations for banner images, body images, text, buttons, and more. 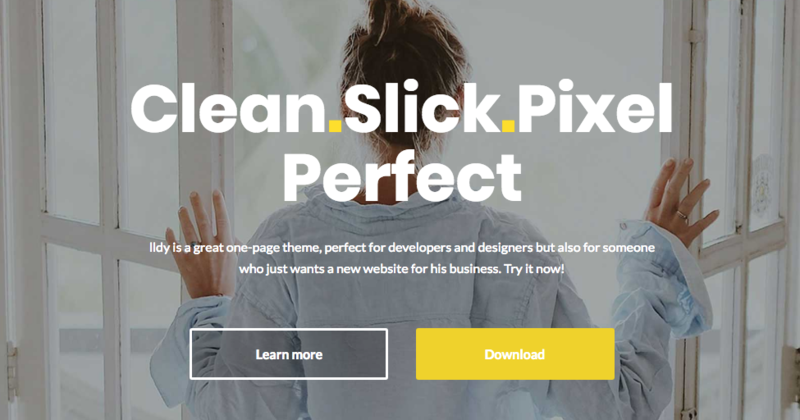 Hip for Homes provides a perfect example of a simple small business website with unique features. Our favorite piece of the website is the homepage, which includes model home imagery describe each facet of home HIP provides products and solutions for. Before we dive into the comparisons of custom websites vs template websites, notice that each of these websites are unique. They were created with the combined knowledge an expertise of forward-thinking business owners and design, development, and digital marketing professionals. Template websites have a wide variety of functionality and features. From WordPress themes to more customizable drag and drop templates, you can do quite a bit with these templates, but they also come with drawbacks. Many template websites can be set up in a single day. A template website will require significantly less time to get up and running than a custom website. The design and most of the coding is already done, so once you develop content for the site, input your logo, and add images and content, you’re well on your way to completion. Generally, template websites are less expensive than custom websites. WordPress offers hundreds of free themes you can use. Premium WordPress themes like Genesis Themes can range from $100-$500 or more. Often, you can find site affordable site hosting, which can work well for businesses who don’t get a ton of traffic. Some companies, like Bluehost, offer hosting for as little as $3.95 per month. Your costs also depend on who is implementing the template and how much manipulation needs to be done to the template design, potentially adding $1,500 plus to the cost. Don’t forget monthly hosting and the cost of writing content for your site. Still, the final cost of a template site is likely to be considerably less than a custom designed site. You can choose from thousands of different templates from hundreds of different companies. This is not how the site would look when you buy it. Instead, you have options to configure the homepage with different button styles, images, captions, menu layouts, etc. If you choose to buy a WordPress theme, you can customize your site even further using plugins, which are applications that add different types of functions and features to your template website. If you have a very low budget and just want to “get something out there,” you can definitely go the template route. Before doing so, however, take a look at some of the downsides. While you can customize certain features, you don’t have nearly as much control as you would with a custom website and a team of designers and developers who can help you make updates to it. This is a short list of the hundreds of different features that are more difficult to add to a template website. These changes can be done, but who is going to make them? A template website is perfect for someone who has a lot of time on their hands, technical knowledge, and the willingness to fail and go through frustration in order to get the end result. If you’re a normal business owner who needs to spend the majority of their time working on the business itself, consider the implications of using a template website that only you have control over. If there’s a glitch, you are the one contacting support to figure out what’s wrong with the website. Need to make a change? Either you’ll make it or you will have to hire a freelancer or web company to make the change anyway. Contrast this with a custom website built by a team who understands your needs. If you work with MLT Group and need to make an update to your website, you simply pick up the phone or email us, we fix it, and you can continue to work on your business. Did you know that many template and hosting solutions provide security as an add-on? If you buy the base package your site may not be covered against security risks. Why is that important? Hackers often target popular template solutions because they know there are many users to exploit. Make sure to check if your website solution comes with SSL encryption, captcha, backup, and more. All too often, business owners who use low-cost template solutions can experience nightmare situations like their entire sites crashing and databases disappearing. Then, when these issues occur, they have no one to turn to for help other than the support of the template company, which may or may not be great. The biggest drawback of having a template website — for a business owner who wants to stand out in their industry — is the fact that you may have an identical site out there. Does having a website similar to others in your industry provide a competitive edge? You can go to lengths to make sure you choose a template others in your industry haven’t, but nothing is guaranteed. Branding is an important factor in digital marketing because strong brands get better recognition on search engines and on social media. Using a template website — while efficient — isn’t going to grow your brand’s presence. Although content creation isn’t part of the development process for custom websites or template websites, it’s important to mention for one reason. Our agency provides content creation services along with custom web development. Why is this important? Content matters quite a bit. It helps your business rank well on search engines. It helps to articulate your brand, engage customers, and even make sales. If you opt for a template solution, you have two options — hire a freelance writer or write the content yourself. With the freelancer option it’s possible — although not guaranteed — to have great content for SEO. The drawback is now you’re having to work with a separate contractor while working on your website at the same time, which means you have less time to spend on your business. The do it yourself option can work, but it won’t work well unless you’re an SEO and content creation expert. Now that we’ve explained the pros and cons of template websites, let’s discuss the pros and cons of custom websites and explain when our services would make the most sense for your business. Custom websites aren’t the only player in the market anymore. With increased competition, it’s our job to show you why our option makes sense for your business. And that’s the key. All things considered, a custom website might not be for you. That’s okay. We want to work with the right businesses and take on projects that are a good fit for both of us. Now let’s start with the pros. 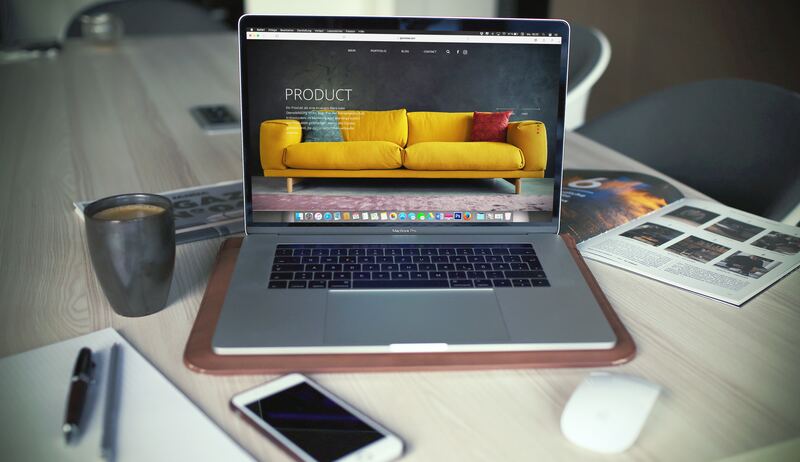 If you’re the type of business owner who likes to share the uniqueness of your business and have input on the way your brand is communicated, it’s wise to go with a custom website. When choosing to go with a custom-built website you have control over all the aspects of the design, branding and call-to-actions. Your design can also evolve as your business evolves. You’ll have access to a team of marketing professionals who can provide insights for your business over time. Perfect example — we helped many of our clients re-build their sites to be mobile-friendly after Google announced it would no longer prioritize non-mobile-friendly websites. Working with a smart agency gives you the reigns to your site while also having an intelligent guide to help you navigate the course of business. Custom built websites can grow as your business grows. If you need added functionality, a custom website can allow the developer to add this over time without the potential limitations of a template website. This is important for certain businesses like e-commerce websites. We can also build highly advanced websites for businesses who need complex solutions like HIPPA compliant databases, thousand plus member membership websites, and online courses. Your business is unique because you, the business owner or the marketing professional in the business, is unique. Do you want a website that reflects your brand and only your brand? In business, unless you have an unlimited advertising budget, a unique brand can be critical to your business. Combine that with the way we interact with businesses online, and having anything less than a stellar looking site can turn off your target audience. On top of our custom design services, we offer full-service marketing — meaning we can help you with any and every digital marketing need you have from SEO to social media to marketing research and more. Not only do we build custom websites, we provide custom solutions to help you grow your business. We sit down and talk with you to understand your needs. We craft a plan as a team to help you stand out among your competition online. Working with an innovative agency means you can work on your business instead of in your business. We’re your strategic partner, meaning we care about growing your business just as much as you do. That being said, there are a few drawbacks to custom web design. Custom-built websites generally have a higher cost than template solutions. While you might have to spend more, you’re getting a more quality product. If you’re truly cash-strapped, however, it might not be wise to spend thousands of dollars on a website. Custom websites are best for established businesses with solid revenue who want to take their marketing to the next level. A custom-built website typically takes longer to build. This is because we go through several quality control measures from start to finish to make sure your website is error-free, branded perfectly, and stands out in a sea of websites. If it isn’t worth 12 weeks of your time to create a great site, custom websites might not be for you. We recommend looking at your business needs, website users, and your overall online marketing goals to help you choose the right direction for your business or organization. If you’re curious about custom websites, let’s talk. We’ll give you a free no-obligation site audit and proposal to see how we can help with your online marketing. I like your blog. You make valid points. It makes more sense that if you want to get a professionally designed custom design packages.